G Suite is a set of online educational tools made by Google and hosted at Emerson, providing opportunities for collaboration and productivity. Please note: your personal Gmail and G Suite for Education @ Emerson are two separate things! You access G Suite with your Emerson Account at google.emerson.edu. More information about Managing Google Accounts here. Here are some ways you can use G Suite to work, share, and publish with ease. Get feedback on a big project with an online survey or make a fun quiz for your friends. Collaborate on your next group project by editing shared documents online. Make a club site to announce upcoming events and post photos and stories from past events. Put your portfolio online for internship applications, or just to show off your work. Make a web-based sign-up sheet for your organization or event. Hangout in a real-time group chat or video call to discuss ideas outside the classroom. Faculty: make a site to post your syllabus, blog, and recommended links with just a few clicks. Contact the Instructional Technology Group for assistance with using G Suite for teaching and learning. To get started with G Suite, go to http://google.emerson.edu and click the link to Sign in through Emerson College. Enter your Emerson account username and password and click Login. G Suite features Google Drive, which allows you to create word-processing, spreadsheet, and presentation documents online. Because documents on Drive are stored and accessed online, you can access them from anywhere. Even though these tools are web-based, they are nearly as feature-rich and as versatile as “conventional” software. Documents can include embedded images, drawings, links, charts, and specialized charts called “gadgets.” You can create online quizzes and surveys using the forms tool, which automatically records responses in a spreadsheet. Editing in Google Drive documents is similar to using Microsoft Office, except that some familiar commands might be found under different menus. Office documents can be uploaded and converted to Google Drive documents, and they can be downloaded in many file formats, including Word, Excel, and PowerPoint. To begin using Drive, click on the Drive link on the Emerson Start Page, or navigate directly to http://docs.google.com/a/emerson.edu/ and log in with your Emerson username and password. Up to 200 users can view or collaborate on a single Google Drive document; up to 10 people (50 for a spreadsheet) can view or edit a document at the same time. A built-in chat tool lets you communicate while doing so. A commenting feature allows users to discuss and track changes on a document, and a revision history feature lets you access older versions of a document. Because documents are available through an online editor, you’ll never have to worry about distributing the latest versions to group members, nor will you have to worry about everyone having compatible software on their computers. G Suite grants access to Sites, a website building tool that can be used to create portfolio sites, group or class websites, blogs, and more—without having to learn HTML. Google documents, spreadsheets, presentations, forms, gadgets, photos, and slideshows can be embedded in your pages. 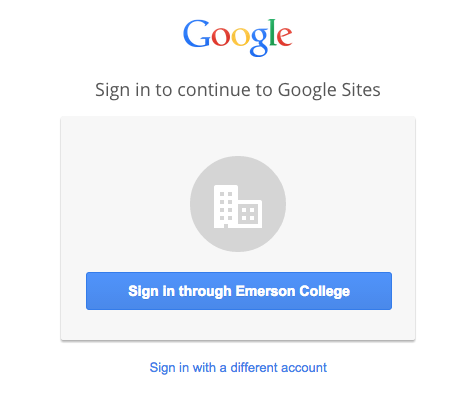 To get started with Sites, go to http://sites.google.com/a/emerson.edu/ and log in with your Emerson username and password. Replace the text in the boxes at top left and top center to name your site and give your page a title. Hover your mouse over the header (where the titles are) to see options for changing the header type and image. Double-click anywhere on your page to add text, links, or files. Use the dashboard at the right to embed dividers, folders or files from your Google Drive, and media from other services such as YouTube, Google Docs, and Google Calendar. You can either embed a folder which users can browse (see an example on the left side of the screenshot), or you can embed a file such as an image directly onto the page (see the right side). Simply drag-and-drop content areas to change their positions. As you drag a block of content around your page, a blue bar will appear to show you where the content will move when you release the mouse. The top of the righthand dashboard has three tabs: Insert, Pages, and Themes. Insert provides your embed options; Pages allows you to create new pages and subpages, which are automatically linked to your home page; Themes allows you to choose a new visual scheme for your site. You can preview your site by clicking the eyeball icon at top right. To the right of the preview button is the Add editors button, which lets you add collaborators to your site or share its link as if it were a Google doc or sheet (note: after creation, your Google site will appear in your Drive and be stored there like any other file). When you're ready to make your site public, click the blue PUBLISH button. You'll be given several options before confirming publication: you can choose your site's address (you can add whatever you'd like after https://sites.google.com/emerson.edu/), and you can choose whether the site should be visible to the public or only to those logged in with Emerson Accounts. You can change this later. Collaboration in Google Sites not only lets groups build sites together, but it creates opportunities for groups to use websites as tools for organizing larger, more complicated projects. For example, a group working on a film could use a Google Site to discuss the project and post important announcements as well as keep their production schedule, contact list, script, breakdown, shot list, releases, etc. in a central, web-accessible place. Access can be restricted so only group members can view and edit the site. In addition, Google Sites provides a useful way to contextualize shared Google Drive folders and files; rather than merely sharing a link to a folder, you can package that folder in an instructive, professional-looking website. Google Sites is an easy way to make a website to share your work with the world. However, sometimes you only want to share one thing, such as a document or spreadsheet. This is possible with Google Drive: once you’ve finished editing a document with Google Drive, choose Publish to the web... from the File menu to make it visible to the world. Hangouts is a set of video conferencing and group chat tools within G Suite for Education. You can hangout with up to 15 users in a video call via any device with a webcam or up to 100 in a group chat, . Go to G Suite for Education @ Emerson and sign-in. Click on the "Hangouts" icon. Click on the "Start a Video Hangout" in the lower right of the window. Allow your webcam and microphone to be used by Chrome. Add the individuals you'd like to chat with via their Emerson email addresses. Google offers a host of online documentation, tours, and videos about G Suite. Learn how to get the most out of G Suite, read the support section, or integrate G Suite at Emerson with Canvas.